That's right. Whoever you think I am, I'm probably not. Let me explain. There are a lot of Jill Scotts out there, at least three that I know of in my town. I'm the middle-aged frumpy one. Back in 1991 when Peanut Head and I were first married, when we were 12, I got a strange phone call from the Maury Povich show. They wanted me to be on their show and they were ready to book me right there on the spot. I was a star. For about ten seconds. Apparently they were looking for the Mrs. America Jill Scott. This one. I know. I'm waaaaay cuter, but still, they wanted her. 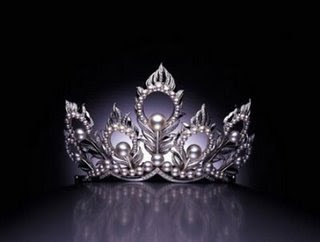 She was being sued by the pageant for failing to reveal that she and her husband were separated. Dang it all. I wanted to throw some chairs on national television. Why can't I get some drama in my life? You want to know the not so funny part about it? When I got off the phone and told Peanut Head that the Maury Povich show thought I was Mrs. America, he started laughing hysterically. Rolling on the floor, peeing his pants laughing. I gave him my You-Might-Want-To-Rethink-That Look, and shortly after we entered into marriage counseling. 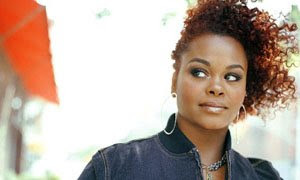 Fast forward another decade or so, and this Jill Scott is famous. Now this girl can sing. If Peanut Head started laughing hysterically because someone thought I was her, I would understand it. I can't carry a tune in a bucket, so he would at least have a leg to stand on. You know, someone did think I was her a couple days ago. I think most of you know that I'm a Creative Memories consultant, right? Well, apparently one of the singer Jill Scott's stalkers found my Creative Memories website and contacted me through it. First it started with an e-mail inquiry that I'll share with you shortly. I don't want to share this person's name with you out of respect for his privacy, but I feel I should tell you that the inquiry was from a man. Now I don't like to make sweeping generalizations, but I can say that I don't get a lot of business from men. I get some, but it's proportionally much smaller than the business that I get from women. Now there was a little more information than that, but I'm just sharing the relevant parts. The answer that he likes to "dra and stuff" was a bit of a red flag because it told me that he probably didn't know what type of business Creative Memories is. I wasn't sure how to respond, so I just sat on it for a little bit. It didn't take long before he decided to take matters into his own hands and call me. Now I have Caller ID, so I knew it was him when he called. I thought about not answering, but then I decided I needed to be professional and get to the bottom of what was probably a misunderstanding. CALLER: Is this Jill Scott? CALLER: My name is Blah-de-blah, and I'm calling about booking you for some Hollywood type stuff. ME: I'm sorry, but I'm pretty sure you have the wrong Jill Scott. I'm not the singer. CALLER: Oh, you not? Well, can I have that numba please? Okay, sorry, but this guy is funny. And kind of cute. And incredibly polite. But I don't want any stalkers in my life, so let's keep it professional and send him off to stalk someone else. ME: I'm sorry, I don't have any idea what her number is. CALLER: Well, okay then. Thank you. We hang up and he calls back 20 minutes later. CALLER: I know you not the sanger, but you don't have a numba for her? ME: No, I'm sorry, I don't, and I think it's going to be very difficult for you to find her because there are thousands of Jill Scotts out there. I'm one of at least three I know of in my small town. Long pause. Long, uncomfortable pause. I think he was in shock. Deflated, depressed, exhausted . . .
Oh Geez, this is painful. ME: Well, what can I help you with, Sir? CALLER: You know, I like art and stuff, and I like to write. Oh stab me in the heart and twist the knife for crying out loud! He's lonely and he just wants someone to listen, and here I am, dying to get him off the phone. I'm such a creep. ME: I don't know if you know about Creative Memories, but I sell scrapbooking supplies and products to help people get their pictures organized. Long uncomfortable pause. Pause which I use to writhe on the floor in agony. Being famous is not all it's cracked up to be. ROTFLOL!!! Holy cow seriously work thinks I have lost it now!! I do like to dra...can I buy sumpin? HA HA HA! That is hilarious! ok, that's pretty funny! you should give him classy chaos' number and he can talk to her little girl! well usually when my phone rings it is either a telemarketer (in which case I don't pick up at all) or the caller hangs up when I say "hello" so. That's the main reason I stick to the computer! Am I the only one that is feeling bad for the man that called? I feel bad for the man that called. You played it all wrong! You shoulda said it was you, or rather that you were her, taken his information and promised him whatever he wanted. It woulda made him happy and given you even more to laugh about. That was hilarious. My uncle married a Kelly so she had my maiden name and I when I married my hubby he had a cousin named Kelly that was married so I had her maiden name. I've been confused with both Kelly's on many occasions. It doesn't help that all 3 of us are blonde and about the same age. Too funn. Funny and yes sad this guy desperately stalking/looking for the singer. I linky'd you today on my post. He was lonely and belongs to the lower half of the bell curve. Kinda sad. The funny thing is if the guy really knew all of your amazing talents he would rather be contacting you instead of Hollywood anyway! That is really funny and kind of you to not be mean. Oh now that is just funny and a little scary too! he he. i actually worked with the second Jill Scott AGES (like, a decade) ago (when she was an intern at a theatre in Philly), and knew about all the singing and grammy winning and such, but was shocked to turn on HBO a few weeks ago and see her starring in The No. 1 Ladies Detective Agency! YaY!!!! I can talk to you again!!! Wahoo!!! I can't believe I actually found this little tidbit out! And when you figure out which of your personalities you are today....are you sure there are only three Jill Scott personalities and not more????? LOL......Will the REAL JScott please stand up? LoL. Makes me wish I had a funny story like that to share -- but I don't. I guess I could make one up... but that wouldn't be fair to you all. So funny! Hahaha. So flipping funny.